Summary: This coaching guide and protocol from the Southern Colorado Writing Project may be a useful resource for program leaders looking for ways to support teachers in presenting their work to colleagues. While the protocol lays out a schedule and rationale for meetings between presenting teachers and their mentors, the guide provides a framework for establishing roles/relationships/responsibilities along with a set of questions that can be used to guide the thinking partners through the stages of identifying a question, researching the question(s), and creating a demonstration/inquiry workshop. The coaching guide provides important reminders for both coaches and invitational summer institute fellows regarding the coaching relationship, the workshop process, and the ultimate outcome of the workshop itself. The relationship between you and your summer institute fellows is one of support and consultation, not evaluation and critique. Ask probing questions. Avoid being “prescriptive.” The final decisions rest with the presenter, not with you; you are not responsible for the success or weaknesses of the workshop. Why did you select this as your FAQ? What personal experiences have led you to believe that this is important? How will you contextualize your FAQ? Relevant theory? Relevant practice? What do you want your audience to take away from your workshop that can improve their practice? How much of your workshop actively involves the participants? Have you acknowledged the experience and knowledge your audience brings to your workshop? Have you made your content relevant to them? a) You rearranged the order of your workshop? b) You left out parts and emphasized a narrower focus? c) You relied more on participant involvement? How else might you accomplish your goals? What time constraints have you acknowledged? Are there ways to make your demonstration flexible, so that you can add or subtract an activity if timing becomes an issue? Can you foresee any questions that your audience might have? How will you encourage your audience to take your content into their own classrooms? Do you know where to go for research? Do you have enough research? Do you know how to build it into your presentation? Do you need help gathering materials or relevant texts? Do you need perspective about how to apply what you are showing to other contents or grade levels? Do you need an opinion about whether an activity teaches the desired lesson? Do you need to run through the demonstration to check for timing, organization, relevance, effectiveness? Do you need a second set of eyes for final copies of handouts and PowerPoint slides? Do you need help modifying your demonstration for another audience? *Adapted from Redwood Writing Project coaching resources. The following is a proposed contact schedule for coaches and institute fellows. It should allow coaches time to help participants establish an FAQ, support them through developing the FAQ into an effective demonstration, assist them in productive refection on the demonstration, and serve as a resource for any participants that will present their demonstration beyond the institute. The time and energy placed into each contact should be dependent on the needs of the participant being coached. Some participants will need additional support, while others may need less. Please keep in mind that this is a general proposal, and that coaches should be sensitive to participants needing additional contact time. Face-to-Face Contact 1: Initial meeting (April 18). Presentation of FAQ and brainstorming time. Coaches will introduce the FAQ as whole group in the AM, then break into their smaller coaching groups in the PM. Allow participants time to brainstorm an individual list of FAQs, but be sure to leave time for sharing, collaborating, and questions. Email Contact 1: Between first pre-SI meeting and second pre-SI meeting. Email group members to check in on progress of FAQs and open communication up for any questions or concerns at this point. Email Contact 2: Between pre-SI 2 and 1st day of SI. Assess research and demonstration needs of coaching groups and gather any possible texts/items from classrooms before departing for the summer and check on progress of FAQ/demonstration. Face-to-Face Contact 3: First day of the summer institute (June 8). Coaches will be present to continue to establish rapport with groups and begin moving them from FAQ to solid demonstration planning. This can be very informal and brief, really just a check-in of progress, an opportunity to address questions and concerns, and an additional assessment of needs. This is also a good time to schedule additional face-to-face contacts based on when SI members have signed up to present. Remember to stress the idea that everything they plan on presenting should be a way to address their FAQ. 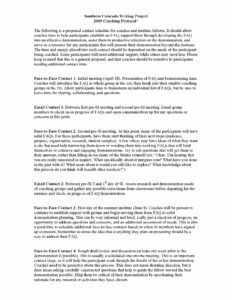 Face-to-Face Contact 4: Rough draft review and discussion (at least one week prior to the demonstration if possible). This is usually a scheduled one-on-one meeting. This is an important contact stage, as it will help the participant work through the details of his or her demonstration. Coaches need to be proactive about this process. This does not mean dictating direction, but it does mean asking carefully constructed questions that help to guide the fellow toward the best demonstration possible. Help them be critical of their demonstration by questioning their rationale for any research or activities they have chosen. Face-to-Face Contact 5: Fine-tuning of completed demonstration (at least two days prior to the demonstration). An informal run-through and final discussion may be all that is needed, although some participants may want to run through the entire demonstration as a way to time it/practice. Check to be sure that everything is ready to go. Talk about time management, organization, and cohesiveness, and go over handouts with cited resources. Allay fears, stress positives, address concerns, and support. Post-SI contact: Contact beyond the institute can comprise mostly of email and forum interactions, although face-to-face contact may be needed if a member of your group is asked to present. Coaches should plan on at least one initial email contact with members of their coaching group to check in on any demonstration work that is continuing outside the institute. As members are asked to present, coaches will be notified via email. Contact with participants presenting outside the institute should focus on assisting them in the modification of their demonstrations to meet the needs and time constraints of the specific presentation opportunities. *Adapted from Redwood Writing Project’s “Coaching and the Summer Invitational Institutes,” by Director Susan Bennett. http://www.nwp.org/cs/public/print/resource/168.